Fathers give us a lot in our life, and teach us many valuable lessons. But sometimes, they get a little shadowed by Moms!! So this Father’s Day, let the kids give their Dad a gift instead. And when it’s made by their own little hands, it’s sure to melt any Dad’s heart! Geek Dads will love a little Mason jar bank that looks like their favorite superhero! This easy craft from Fireflies and Mudpies requires very few supplies, but looks very impressive! Parents website features a smart looking set of coasters for Dad to rest his drink during his favorite show. Use Dad’s favorite colors for bonus points! Does Dad need a little help organizing his stationery? Help him with a super easy desk organizer from Parents website. Make it completely in one color or try complementing colors for more interest. The Tortoise and the Hare have this tutorial for a really, really easy but adorable mustache mug that’s perfect for Dad! All you need is a mug, a sharpie and gel stain – that’s it! If Dad likes vintage, then he’ll love this handmade gift from The Mother Huddle. Ask kids to select the photos and print them. Use glue to make it simpler for the kids to attach the photos to the watch. Let Dad know that he’s the best with this trophy from Smart Class!! Kids will have a whale of a time finding waste around the house to stick on the trophy and a final spray paint will just seal the deal! Dads love a bit of silliness, and this DIY bookmark from Dollar Store House is just that! It is so easy to make that the kids won’t be able to stop at just one! This is one gift that’ll really bring out the ‘Awww’!! Originally on Kaboose, Inspiring Pretty shows us a plain mug with a lovely message, made of Daddy’s and kid’s thumbprints. Moms usually complain of having the world in their bags, but Dads have heavy pockets too! This catchall tray from Modern Parents Messy Kids will help Dad unload his pockets in a place just for him! Boring photo frames are passe; make Dad impressed with a very personalized one featuring him and his little princess. While the base might need some adult help, kids can pick out the tiles and stick them on, along with their favorite photos! 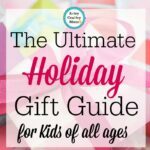 Most of these gifts require very basic supplies, so if you’re the last minute gifting-type, it doesn’t matter! 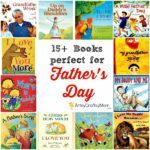 Making their own gifts gives the kids a huge amount of satisfaction, and every time Dad looks at his little one’s handiwork, he’ll be reminded of how lucky he is! 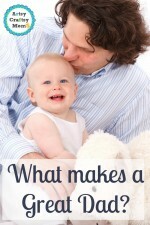 What makes a GREAT DAD?